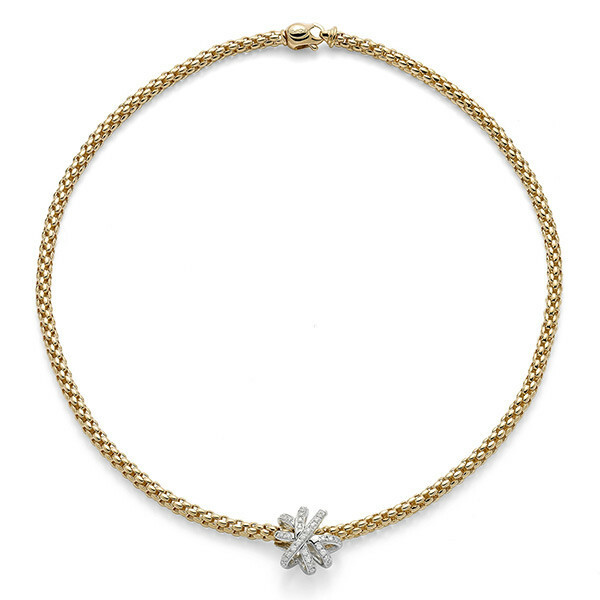 Flexibility is this Fope necklace's strong suit! Part of the designer's Flex'it Solo Venezia collection, the 18K yellow gold piece has an attention-getting, statement-making centerpiece of open geometric shapes set in white gold. The forms, embellished with diamonds, intersect to create a motif that will bring to mind either a flower or an atomic structure. The dazzling piece of jewelry that will drape your nape in deliciousness measures 17". This necklace from Fope will be cherished today and tomorrow.